Today, we are going to discuss the Composition Scheme Under GST Act. Composition Scheme GST has been implemented to eliminate the cascading effect which was prevailing in our country in the form of a number of taxes such as Service Tax, Sales Tax, octroi etc which were resulting into multiple taxation or double taxation. With the implementation of GST, 17 taxes have merged into it. Although, cascading effect has been reduced and multiple taxes has been merged but the compliance procedures under GST has not proven easy to follow for Small and Medium Sized Enterprises. A large group of people is ready to pay the taxes but unable to comply with such procedures. This reason gave birth to the composition scheme under GST which has proven a big relief to small and medium suppliers. Composition scheme was already part of earlier Sales Tax Law and now it has been continued under Goods and Service Tax. Many of the business people are confused regarding composition scheme of GST. There are a lot of questions in there mind like what is the eligibility criteria? Who is excluded from this category? What is the GST rate payable under composition scheme? Is it actually profitable or not? what are the benefits under composition scheme? Those businesses whose aggregate turnover in the preceding Financial Year does not exceed 1 crore (75 lakhs in case of North-Eastern states and Himachal Pradesh). The upper composition scheme limit under GST of 1 crore and 75 lakhs as the case may include turnover within a state only. 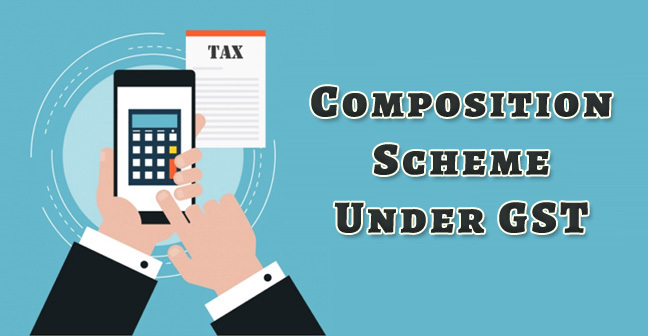 It is necessary for the person to be eligible under the composition scheme that all his branches throughout the country opt for the composition scheme. For example - the person opting composition scheme GST for the Rajasthan Branch and Normal scheme for the Maharashtra branch will not be eligible for the composition scheme even for the Rajasthan also. He has to opt for this scheme for all the branches of his business throughout the country. A casual Taxable person or a Non-resident taxable person. The benefit of Composition scheme can be availed by Supplier of Goods only. Service providers are specifically excluded from this scheme except for restaurant service providers which means restaurant service providers are eligible for such benefit. Restaurants who are already liable to pay the GST at the rate of 5% (without ITC) could not claim the benefit of Composition scheme under GST. Restaurants who are liable to pay the GST at the rate of 18% (with ITC) can claim the benefit of composition scheme in GST. Enterprise should not engage in the interstate supply of goods i.e. only intra state supply of goods are eligible under this category. However, there is no such limitation in purchasing goods from outside the state. Persons dealing through the e-commerce in order to supply their goods are also outside the scope of composition scheme which means any dealer who is supplying goods through Flipkart or Amazon cannot avail the benefit of composition scheme of GST. Business verticals having same PAN also have to opt for composition scheme for all the business verticals. For example, if one business is textile and other is mobile store then he will have to opt composition scheme for all such business verticals if he wants to avail the benefit of composition scheme under GST. The dealer who is purchasing goods from the unregistered supplier either have to pay tax under Reverse Charge Mechanism or shall not be eligible to avail the benefit of composition scheme under GST. Other Eligible suppliers 0.50% 0.50% 1% of the T/O of taxable supplies of goods. Under the Composition scheme, GST rate will be applicable on the taxable supply within a state / UT but excluding inward reverse charge mechanism supplies and exempt supplies. Mrs. Mala, a trader supplied 500000 taxable goods and 200000 as exempted goods. How much GST will be payable by her under the composition scheme? The person getting registered under the composition scheme can pay tax on the quarterly basis before 18th of the month immediately succeeding the quarter. The dealer under the composition scheme is benefited by the reducing tax liability. The composition supplier is liable to pay GST at the rates lower than the normal rates as mentioned in the above table. The composition dealer is not required to issue a tax invoice. They can simply issue a bill of supply because they are not allowed to collect the tax from the customer. It is not mandatory to maintain complete records like books of accounts. A casual taxable person has to file minimum 3 returns per month and one annual return i.e. 37 returns in a year and he will also be liable to pay the penalty in case of non-compliance. But the composition dealer is required to file only 5 returns annually which includes 4 quarterly returns and one annual return. (GSTR - 4 on a quarterly basis and GSTR-9A on annual basis). Dealer under composition scheme can’t avail the benefit of Input Tax Credit which means that they do not get the benefit of Tax paid during the purchases. The dealer under the composition scheme in GST are not allowed to collect tax from the buyer, they have to pay it own. Composite dealers are restricted to make the supply within the state only. They are not allowed to make any interstate supply. They also get down with the provision of not availing Cenvat Credit of previous law like VAT, service tax, excise duty etc.